Evesham Township is welcoming another business firm into the area today, Thursday, as Mohan's Village Paint and Hardware Co. opens its doors at Marlton Square Shopping Center on Route 70. 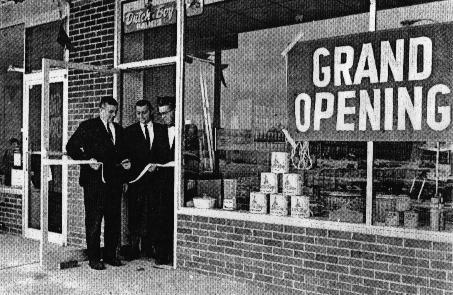 Ribbon-cutting ceremonies were officiated by Mayor George DeChurches and Cherry Hill Mayor John C. Gilmore, assisted by the store owners, Vince and Florence Mohan. To kick off their grand opening, the proprietors will be in business from 9 a.m. to 8:30 p.m. today, Thursday, tomorrow, Friday, and Saturday, March 5. At 4 p.m. on Saturday, Mayor DeChurches will be on hand to judge the prize contest being held in conjunction with the opening. First prize is a portable TV set. Other prizes to be awarded include: 10 gallons of Dutch Boy paint; a two and one-half quart Corning ware saucepan; six men's tool kits; three antiquing sets; and a paint brush. All residents are eligible to participate in the event. Coloring books will be distributed free to children. Owned by Luria's Marlton Inc. of Philadelphia, the building consists of 2,000 square feet. products include a full line of Dutch Boy paint, all types of paint sundries, hardware, appliances, art supplies and equipment for making keys. The Mohans, who reside with their daughter Pat in Cherry Hill, previously managed a lumber yard in Medford, for three years. Regular business hours will be from 9 a.m. to 5:30 p.m. , Mondays through Thursdays; 9 a.m. to 8:30 p.m. on Fridays; and 8:30 a.m. to 5:30 p.m. on Saturdays.